I was at Sg Wang, window shopping, when the call came at 1745hrs. It was my Ops Officer, asking me to report to Bilik Gerakan (BG). 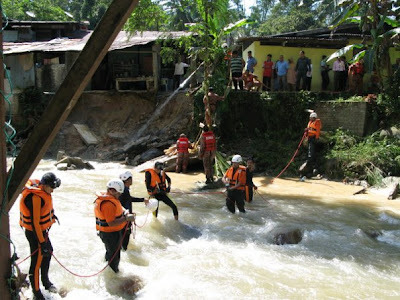 The case...a house had partially collapsed into the swollen river, taking 1 person with it. I then proceeded straight to BG which located nearby at Jalan Semarak. 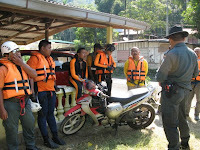 Our RIM (Rapid Intervention Motorcycle) had proceeded to the location to do the primary assessment. It was then followed by our RQ (Heavy Rescue Vehicle) and lastly by the Land Rover of which the Water Rescue & Scuba Unit was in. The roads were heavily jammed... even with the siren & flashing strobe lights...sometimes Malaysian drivers are so occupied either on their phone or chatting with their GFs that they hardly notice what's happening around them. Arriving at the location, the water level was still high. Upon inspection, the back toilet and part of the kitchen are gone. Slabs of concrete and bricks lay in the river. The victim is a 40 yrs old male. He was in the toilet when it happened. We then decided to wait for the water level to recede a bit. 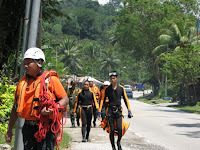 After discussion with other agencies, 4 of our guys from JPAM (Jab Pertahanan Awam Malaysia) and 2 from JBPM (Jab Bomba & Penyelamat Malaysia) conducted the in-water search. The search went on until midnight. Still no body in sight. After that, its time for me to have my dinner. Today (Friday) was the final day...Day 4. Either we find him today or we have to wait until someone finds him. We were all very tired from almost 4 continuous days of searching. The search party coming back after the operation was closed down. 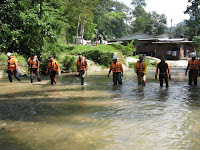 Actually, yesterday (Day 3), a body was recovered somewhere in Puchong/PJ area along the same river. The family said that it was not him. Even though deep down inside our hearts, we knew that there is a very high possibility that it was him, we had to continue our operations. I could not write that here yesterday, as the family had not verified that it was him. Even though we have been conducting our search localize near to the red zone, there are people looking along the river from Gombak right up to Kelang, esp the rubbish collection areas. JPAM, JBPM, Skuad Penyelamat DBKL, JPS...almost everyone. Finally today, at 1130hrs, as the search team was in the river, the brother of the deceased came to inform me that the family had verified that the body found yesterday was actually him. Alhamdullillah. Now the family can prepare to give the deceased a proper burial. Al-fatihah.